Laboratory Power Supply in 1V steps, DC 1-15V 5A + AC 1-15V 5A New developed power supply for DC and AC voltages. Especially concepted for science investigation, technical education, electrical industry and servicing of AC-circuits, transformers, illumination. 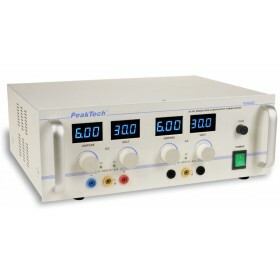 The durable power supply connects easy handling with a good performance. Laboratory Power Supply in 1V steps, DC 1-15V 10A + AC 1-15V 10A New developed power supply for DC and AC voltages. Especially concepted for science investigation, technical education, electrical industry and servicing of AC-circuits, transformers, illumination. 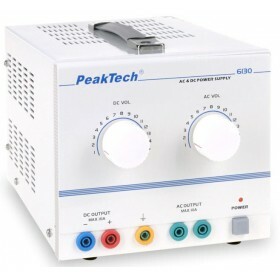 The durable power supply connects easy handling with a good performance. Laboratory Power Supply, DC (not Leveled) 0-30V 5A, AC 0-30V 5A, Digital Meters New developed power supply for DC and AC especially concepted for science investigation, technical education, electrical industry and servicing of AC-circuits, transformers, illumination. 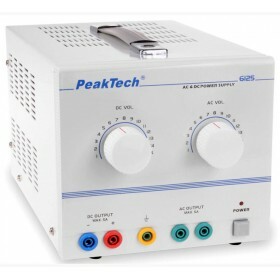 The durable power supply matches easy handling with good performances. 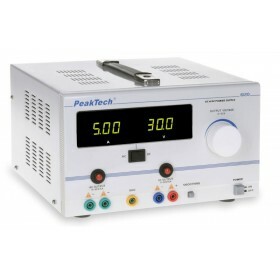 Laboratory Power Supply, DC 0-30V 0-6A, AC 0-30V 6A, Digital Meters This high precision DC/AC power supply provides with two adjustable outputs of DC and AC. The DC voltage is stabilized and is adjustable from 0 to 30 V, the DC current limit is adjustable from 0 to 6 A. The AC voltage is adjustable from 0 to 30 V, the AC over-current LED indication is adjustable from 0 to 6 A. Both the blue colour 3 digits LCD volt and ampere meters guarantee the indication of each of the two output with high accuracy. Especially conceived for servicing of AC-circuits, transformers, illumination, etc.